When the Northern Insights Speaker Series was announced I was excited, mainly because it was a new idea coming from the Fort McMurray Public Library, a place I know and have long loved. Libraries have always been an essential part of my life, from my very young childhood years when weekly library visits were just part of the routine. The library here has been a part of my life since we first arrived, when it was still housed in the municipal building on Franklin Avenue, and now to its new-ish home at MacDonald Island Park. I've seen it grown to encompass videos, and music CDs, and e-books, and so when the board announced they were starting a new speaker series I was delighted - but even I could not have predicted how this would turn out both for our community, and for me. I was at the press conference when they announced the first two speakers in the series, and when they said the name Malcolm Gladwell my jaw dropped a little. You see I first read Gladwell when he published "The Tipping Point", and I recall reading the entire book in about a day, devouring the ideas because they were so similar to my own. I have followed his career avidly since then, and always been a huge fan, but never, ever did I think I'd get a chance to see him right here in Fort McMurray. And even more to the point I never, ever imagined I'd have the chance to meet him and exchange ideas, not just here but anywhere. 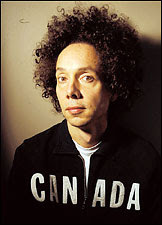 But hearing Gladwell speak, and meeting him, happened to me right here in Fort McMurray last week. The library so kindly invited me to a little meet and greet event on Wednesday afternoon, and I will never forget when Gladwell first walked into the Teen Section at the FMPL. I would recognize him anywhere, those unusual features, that hair, and that slight build. I felt slightly in awe but over the last two years I have become a master at faking ease, and so we launched into a discussion full of quips and laughs, and, on occasion, real ideas. He and I talked about this blog, and when he addressed the gathered crowd briefly he spoke about how this community is on the edge of making a decision about who we want to be, something I have long believed to be true. He spoke about how different places do different things with resource wealth, and how communities can pursue different directions with those newfound riches. He spoke a bit about hockey, too (losing me there because I must admit I am not all that avid a fan of the sport), and he spoke about how he would expand on his ideas that evening at the actual speaking event. I think that small taste left us all wanting to hear so much more, which we, along with hundreds of others in this community, did that evening in the Nexen Field House. I was there in the field house that night with the Intrepid Junior Blogger and young Nathaniel Crossley, likely two of the youngest in the audience. Nathaniel had been invited to the event too, and had met Gladwell earlier that day, while I wanted the IJB to hear what Gladwell had to say. You see the IJB thinks a lot like Gladwell too, something I noted that morning when I had driven her to school. I had asked her if she wanted to see him speak, and she asked more about him. I told her about the book "Blink", and the idea that the two-second judgements we often make when first encountering a situation or person turn out to be the correct ones, despite societal pressure to "think things through" or "evaluate". She looked at me as I explained it, and with an expression indicating that perhaps I wasn't very clever said "Well, Mom, of course. In those two seconds we are making tiny subconscious observations that form those judgements, they aren't just random thoughts", and hopped out of the car and onto her day. I was left sitting in my car thinking that maybe she was the adult and I was the one who should be in junior high, and so I knew she would enjoy hearing him speak. 1) Framing - In order to build anything you need a framework, and this is true for community, too. Who do we wish to be? What do we value? What ideals do we want to incorporate? What do we want our finished product to look like? As Gladwell said it doesn't matter what the answers are, just that we have them, because we need to answer these questions to determine direction. 2) Physical community - Gladwell emphasized the importance of connection, and not connection of the internet sort. He believes in the need for physical community, for large gathering spaces where people can meet and be together. This simply makes sense to me because humans are "pack animals", social creatures not meant to live alone or in the isolation often imposed by our computer screens. 3) The value of isolation - This might seem to run counter to the previous point, but he doesn't mean individual isolation. Gladwell means that our community's physical distance from other places allows us some freedom - to be creative, to be different, to be innovative, and to go our own way. It's funny because I think that is exactly what we do, although I had always wondered why it is so common here and so uncommon elsewhere. Perhaps Gladwell already identified why it is so prevalent here, this pioneer thinking we engage in - perhaps it is because our isolation gives us freedom. I was intrigued that night when he referred to our community as a grand experiment, as that is what I have always said about this place. I think that's why I love writing about it so much, because this is an incubator of sorts, new ideas constantly brewing in this mad little petri dish of a place. In fact earlier that day I had told him I think of life here as a great social experiment, one intriguing to observe, but a bit worrisome too because it could go either way. It could be a great success, or a great failure. It could be a grand example to the world of a community using resource wealth to cure societal woes, or a cautionary tale about how excess cash leads only to social inequity and Prada stores. When Gladwell finished speaking he answered questions from the audience, an exercise I always enjoy. As I suspected someone asked him where and how he writes, a question I have noted successful writers are often asked (it's as if some perhaps think the magic they create comes from a special chair or a special desk, when of course it comes from inside their head). Gladwell answered that he writes in coffee shops, preferring to write surrounded by the hustle and bustle of New York City, where he resides. The IJB jabbed me at this and whispered "that's just like you" because I too prefer to write where I can observe the world, not content to hide away. It seems perhaps Gladwell and I are examples of that need for physical connection in the world, too. He spoke about how being a writer satisfies his innate curiousity, and how he wakes up every day thinking he could learn something totally new - and of course this is my approach to the world, and my work. I approach it all with infinite curiousity and desire to learn, and a desire to share what I have learned, too. In the end he said that the best thing we can do is go about our business of building a proud community, and telling our story to the world in whatever way we can. And that brings me back to earlier that day, when he and I spoke about writing. Malcolm Gladwell told me the book he would like to read about Fort McMurray, and he suggested that perhaps I should be the person to write it. We spoke about resource wealth, and community, and framing, and deciding who we want to be. He planted a seed inside my head, one growing even now and that will, I suspect, become a book and one I hope he will want to read, because I want to write it. That night on stage Gladwell was asked how we tell the world about us, and I was busily taking notes. When he said "earlier today I met this wonderful blogger that many of you likely know, and she has an important role to play" I found myself overwhelmed. I was stunned that not only did he remember me but that my story had made an impression on him, enough that he felt it worthy of mention. In his brief address earlier that day he had commented on how the digital revolution has given the common person a powerful voice, and I am indeed a common person. I came to this community as a stay at home mom to a three year old, and I had not written in years. I could have never dreamed of the opportunities I have now had, or of meeting the people I have now met. Just over a decade ago if anyone had suggested I would one day be discussing the book I should write with an internationally renowned author and intellect I would have scoffed at them. I would have said those things don't happen to ordinary people, but I was wrong. You see, thanks to this incredible place, and organizations like the Fort McMurray Public Library, those things DO happen to ordinary people. They happen to ordinary people just like me, and I know that because last week it did, when Malcolm Gladwell looked at me and said, "The book I'd like to see you write is about..."
and for bringing Malcolm Gladwell to Fort McMurray.